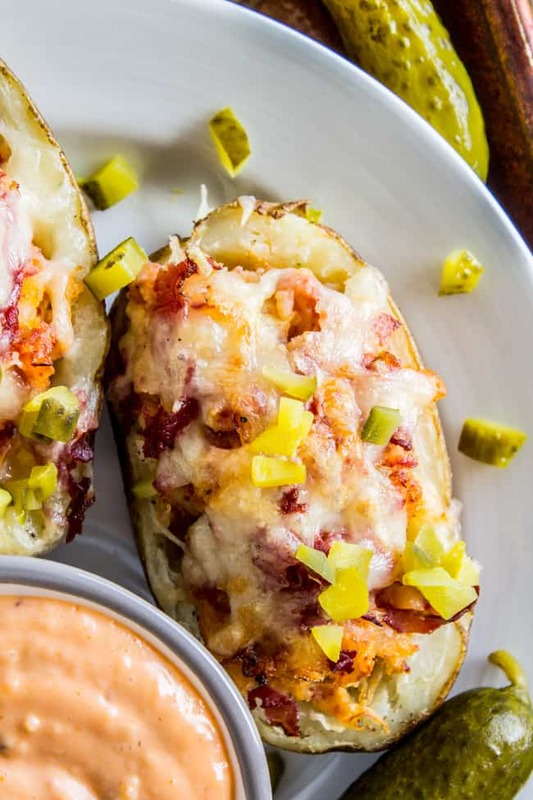 All the beauty of a classic Reuben sandwich, baked in a potato. Corned beef, sauerkraut, Thousand Island dressing, and swiss cheese is one of the best combos knows to man! 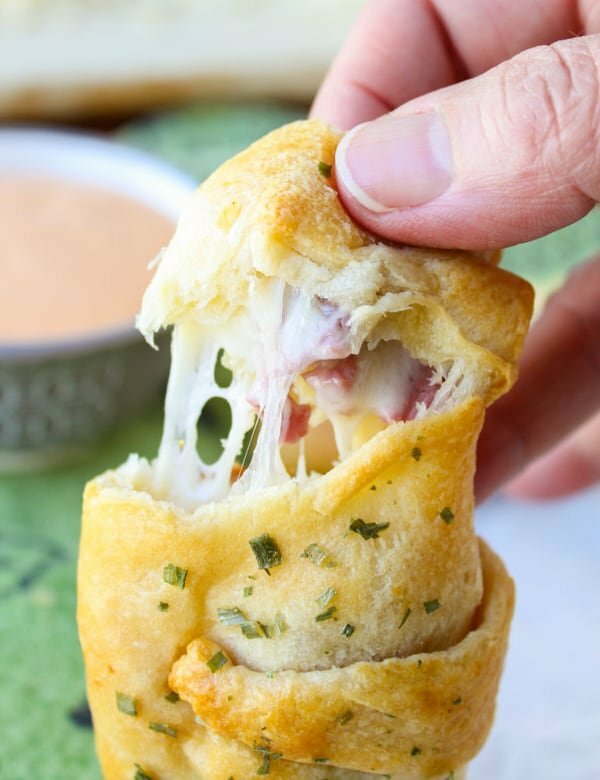 This makes for an easy weeknight meal OR great game-day appetizer. Well now I know, because my husband is turning into a living, breathing Dad Joke. Amelia Bedelia is in ballet class. The teacher tells the kids to go to the barre. Amelia says, “I’m too young to go to a bar.” I can hear Eric having a good chuckle at this behind me. 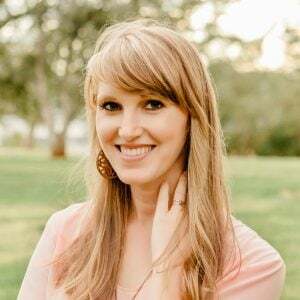 The teacher tells the kids to plie, and turn their feet out, “until a big piece of pizza would fit between your feet.” They all do it, except Amelia, whose feet are much too far apart. “I love pizza,” she says, “That’s how much I would eat!” HE’S LAUGHING OUT LOUD. Now the only thing left to wonder is when the Mom Jokes are going to start. Am I already there? How will I know?? 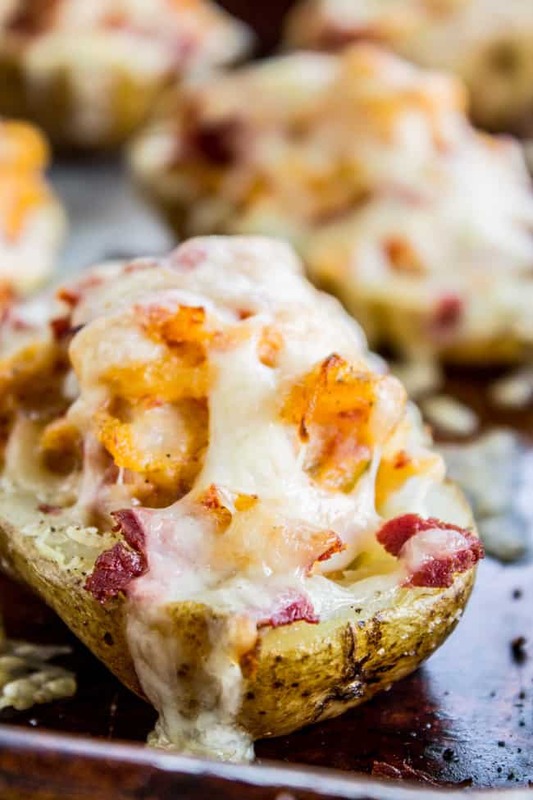 I was feeling pretty lazy as I threw the cheese on top of these potatoes, and tons landed on the sheet pan, meaning it got baked all crispy, like in the photo above. But then I scraped it off and threw it on top of the potato I was eating…OH MY GOSH. 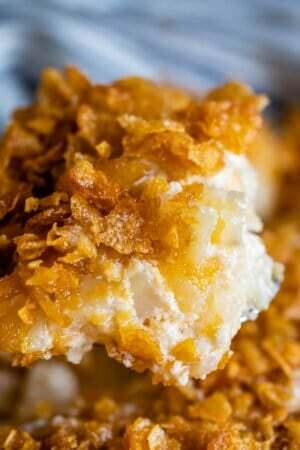 Crispy Swiss cheese is like this whole other thing!! Tons of flavor. 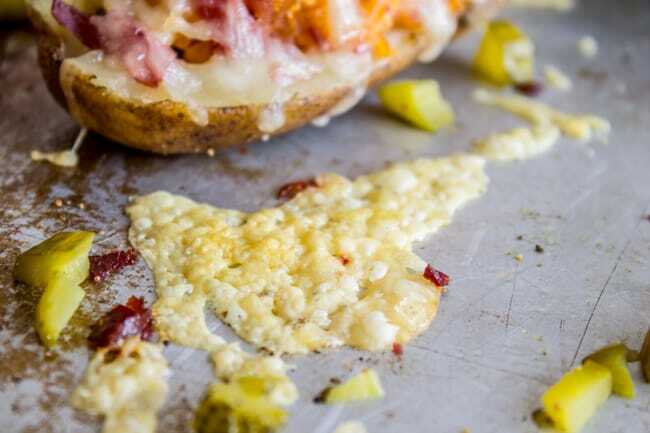 So be a little lazy when you sprinkle your cheese. 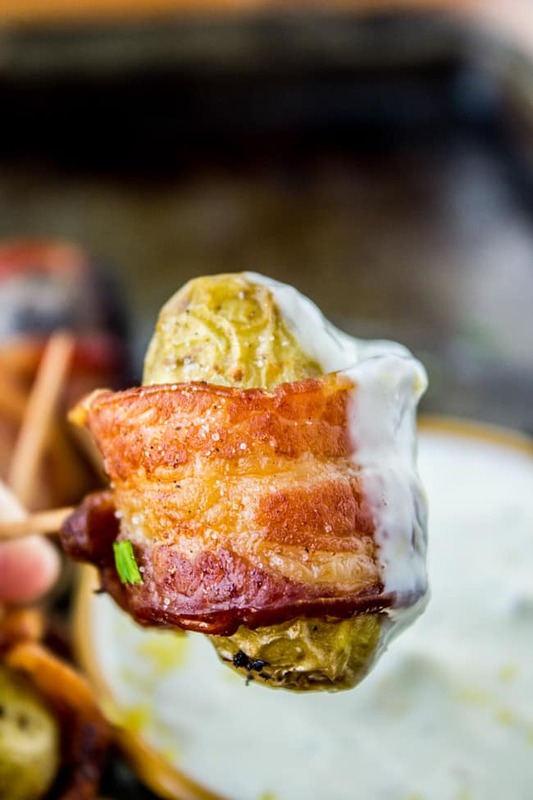 We had these for dinner like I mentioned, but they are finger food enough that you could totally bring these as an appetizer to any March Madness games you plan to watch! If you make this snap a photo and share on Instagram using #TheFoodCharlatan! I’d love to see what’s going on in your kitchen! Start by baking the potatoes. You can either do it in the microwave or in the oven. * First, clean the potatoes well and pierce 2-3 times with a fork. Rub a small amount of oil all over the outside. Generously sprinkle each side with salt and pepper. For the microwave, place the 4 potatoes on a microwave-safe plate. Cook on high for 5 minutes, then turn the potatoes and continue cooking for 3-5 minutes, or until fork-tender. Slice the potatoes in half when they are cool enough to touch. 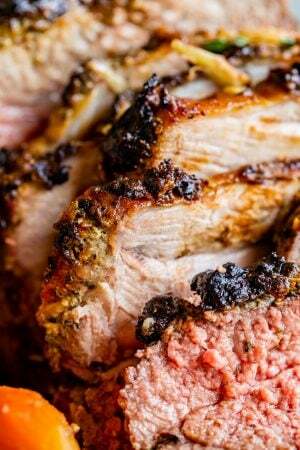 Place each half on a greased sheet pan. Use a spoon to gently scoop out the flesh of the potatoes. Leave a 1/2 inch or so on the bottom and edges so that the skins don't fall apart. 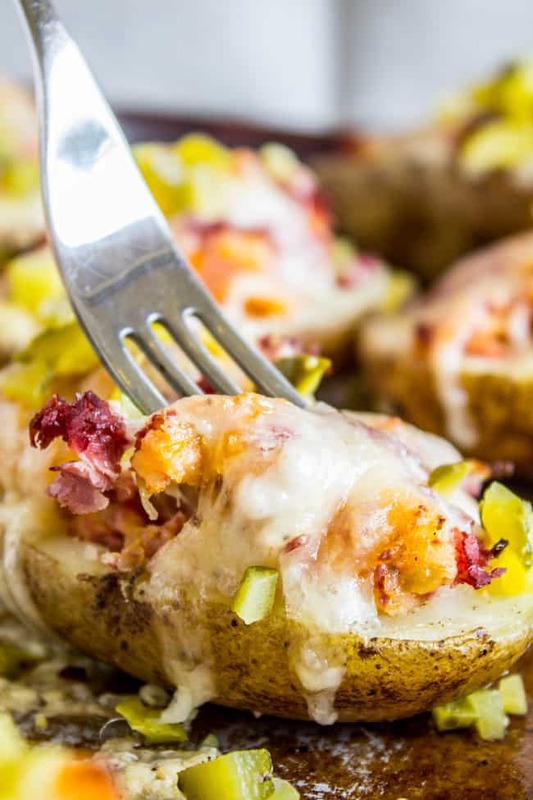 Add the potato innards to a medium skillet and set aside. Sprinkle the inside of the skins with salt and pepper. Meanwhile, chop the corned beef into bite size pieces. 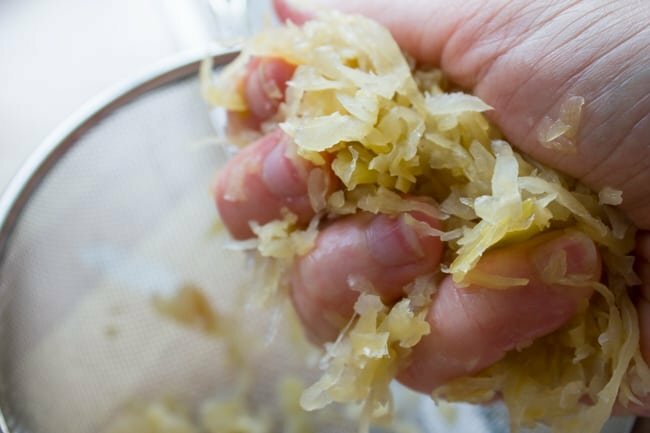 Scoop out 3/4 cup sauerkraut and squeeze dry. 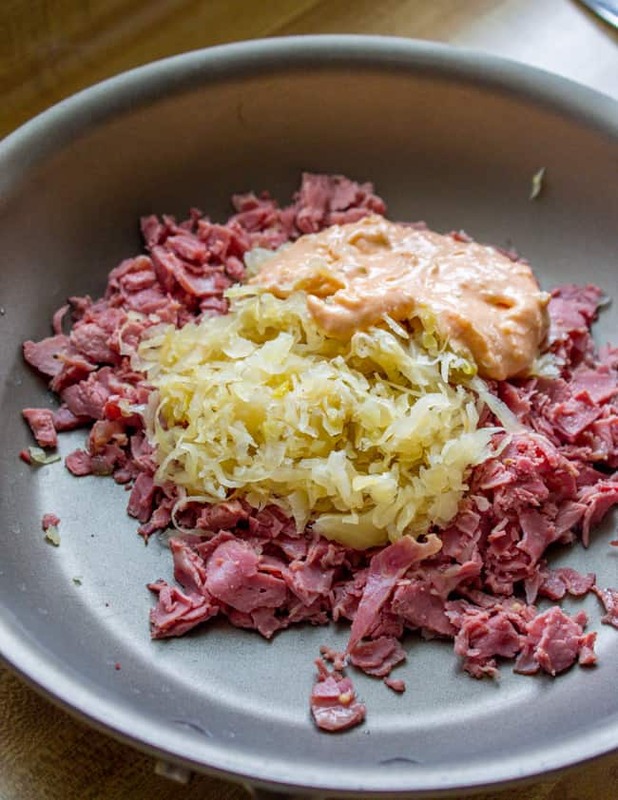 Add the corned beef, sauerkraut, and Thousand Island dressing to the skillet with the potatoes. Set over medium heat. Cook for about 5 minutes until warmed through, mashing the potato with a wooden spoon. Distribute the filing evenly amongst the skins. Top with 1 cup shredded Swiss cheese. Bake at 375 for about 12-15 minutes, or until bubbly and warmed through. If you like extra crispy cheese, turn on your broiler and broil for another 1-3 minutes. Remove from the oven and garnish with chopped dill pickles. Serve with extra Thousand Island dressing! *If you want to bake them in the oven the traditional way: oil and salt and pepper as stated above. 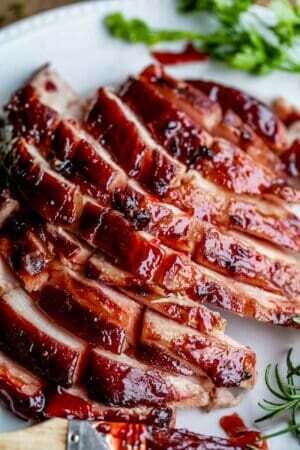 Wrap in foil if you like soft skins, place directly on rack if you like crispy skins. Bake at 350 degrees F for about and hour, or longer if necessary. They are ready when a fork slides in easily. 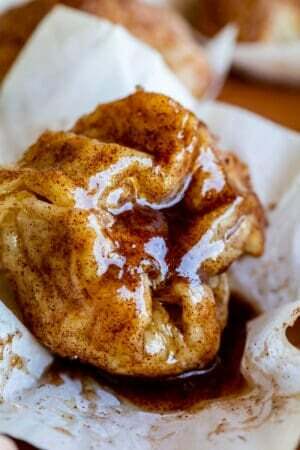 You will love these other recipes! 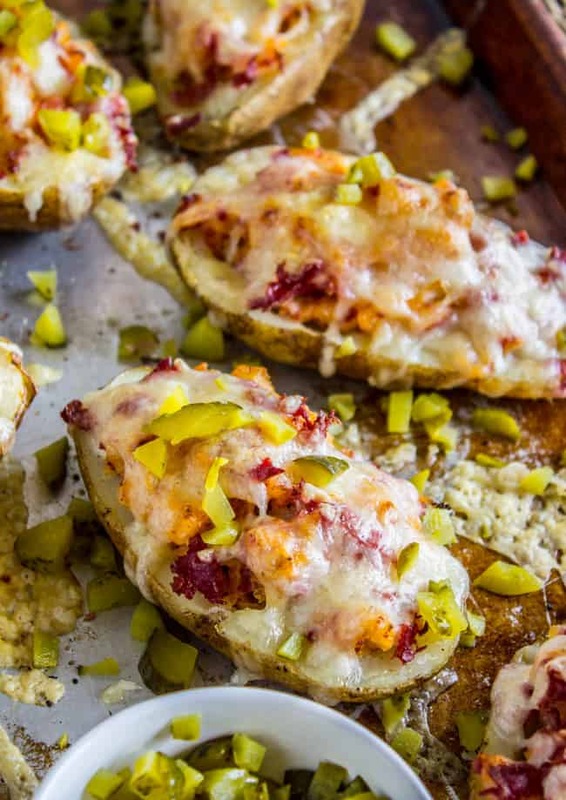 More twice-baked potatoes from friends! I’VE BEEN THERE!!!! TO Shapiros!! GAHHHH. (Also, Lucas says I’m the one who makes the “dad jokes”…already). 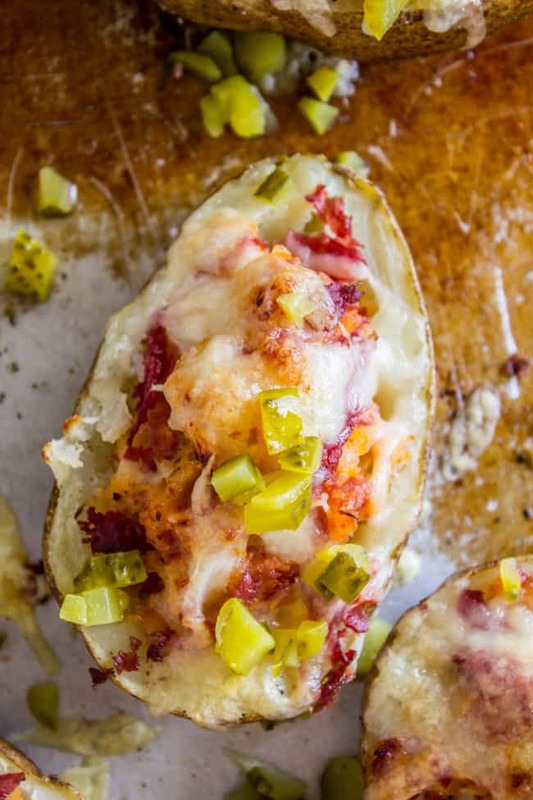 These stuffed potatoes look amazing! I just made some recently that were close to this flavor profile. I added diced ham, & roasted cauliflower, Dijon mustard, chives, and turmeric, to the mashed potato flesh. 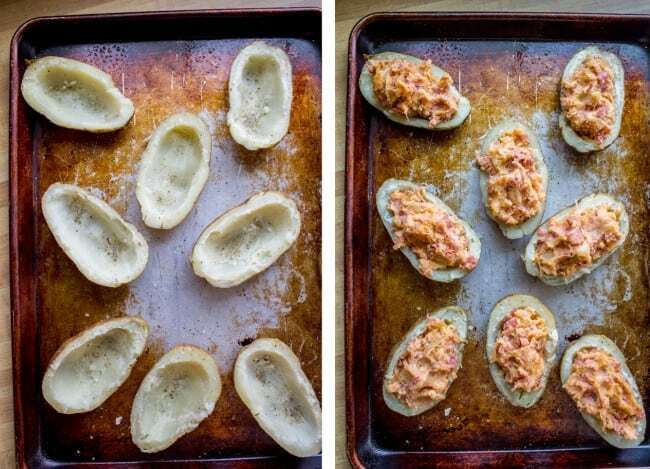 I will give these a try w/ the thousand Island dressing, ( I make my own) & sauerkraut. Thanks for a yummy post! Dads also come out of the womb thinking burbs and farts are funny. In other news – THESE potatoes. I NEED. it’s so true!! My sister was telling me the other day that her entire family (4 kids) were having a fart sound contest at the dinner table the other night. So maybe my family is just classy like that. haha! Karen I love this. I had to come over when I saw it to check it out. 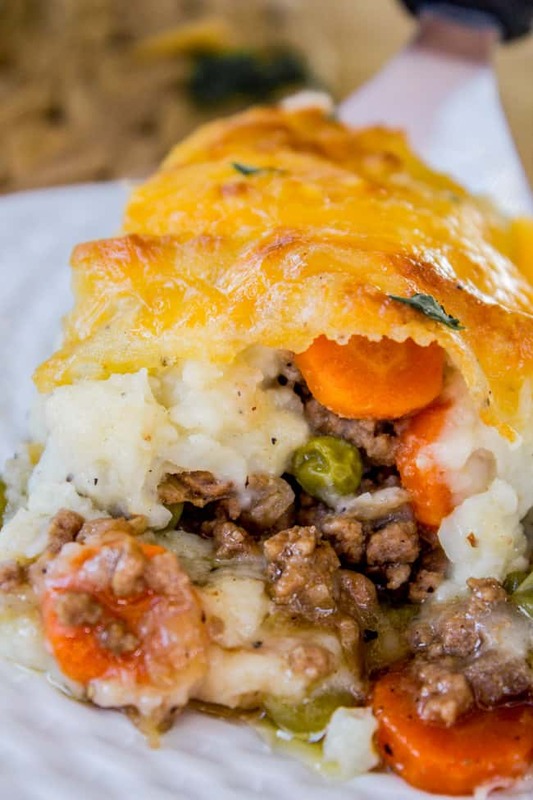 This is 100% a recipe I would make and devour. Thanks Peter! 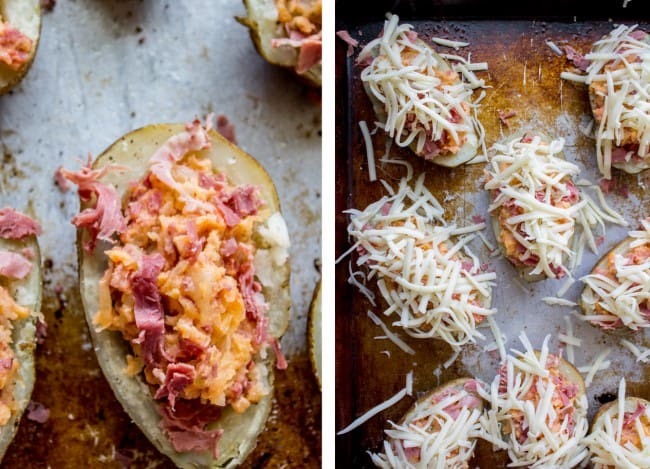 Twice baked potatoes are always a crowd pleaser :) And so are reubens! My dad would say that exact same thing to us as kids! My husband is so there too, so it just must be a dad thing. These potatoes are killing me, LOVE!!! I’m pretty sure Adam himself was telling the Hungry Thirsty joke to little Cain and Abel. It’s a dad rite of passage. i think the dad jokes simply come with age and a specific personality type. my dad is ALL about the dad jokes. and boyperson, who i’ve been with for eight or so years and is just now entering his 40s is also ALL about the dad jokes. and we neither have nor plan to have children. you can tell they’re really dad-ding it up when not only do they make their own, they repeat it at any and all possible occasions. and if you aren’t there, they’ll come home and tell you who they got to tell the joke to and how hilarious it was.